John Whiteside was born in the 1950s in Tupelo, Mississippi, where one of his earliest memories is of riding on his dad’s shoulders for over a mile to see hometown boy Elvis Presley at the 1956 Mississippi State Fair. Though standing in the back, John saw the show from seven feet up and was amazed at the sight of Elvis gyrating his hips and singing. John noticed that some people had left abruptly at that same sight—at the time, John did not know that the Southern Baptists considered dancing to be a sin. He also did not know the Southern Baptists split from the Baptists in 1845 over the issue of slavery. A few weeks later, John’s kindergarten teacher explained to him, “All good people write with their right hand.” But John’s dad wrote with his left hand, and so John tried to argue the point to his teacher that since his dad was a good man, he too was going to write with his left hand. To this day John writes with his left hand, but does everything else with his right hand. Going to church in 1950′s Tupelo was another experience that struck John as odd. John was a Catholic, and it seemed that very few people in Tupelo liked Catholics. In 1960 John’s dad, a fighter pilot with the Air Force reserves, was recalled for active duty during the Berlin Crisis, and the family moved to Birmingham, Alabama. While stationed there, John’s father blew the whistle on the Adjutant General of Alabama for using Air Force aircraft for hunting safaris. It was a brave move, and terminated the his father’s career with the rank of Colonel. The Adjutant General was subsequently fired and forced to resign his commission. John witnessed the Birmingham civil rights riots and the aftermath of the bombing of an African-American church. By this time he was disgusted by all forms of discrimination. For example, as a member of the high school swim team, he questioned the head of the athletic department as to why swimmers were not allowed to wear and receive an athletic letter. The coach replied that “swimming is what you do out back in the pond, and it’s a girl’s sport.” John and another swimmer in his high school became All-Americans, and helped the team become state champions. The press forced the coach to acknowledge swimmers were athletes and letters were awarded. John’s ambitions in college turned to flying. Research revealed that 95% of airline pilots came from the military. Though John did not agree with the Vietnam War, in 1971 he joined the Marine Corps. Uncle Frank and John began discussing civil rights, his Rosa Parks decision, and his Selma March decision, and both got a laugh out of Uncle Frank telling his Alabama Law classmate George Wallace to “get the hell off the steps of the University of Alabama” or he would go to jail. This was during the time of the Mai Lai Massacre, and a year later, Lieutenant Calley, who was prosecuted for the massacre, was paroled. Uncle Frank told John that whatever he chooses to do in life, he should make sure it is legal, and that he should fight for what is right. He stressed that although you may lose, in the end you will be a winner. Fortunately, the Vietnam War was over by the time John graduated from the University of Alabama. The Marines never told John jets were only 25% of Marine aircraft, and helicopter time was not attractive to the airlines. He graduated first in his Marine class and was awarded the opportunity to fly jets. Then he graduated at the top of his class in jets as a Marine and was awarded a prime assignment in Hawaii, flying his first choice of fighter, the F-4 Phantom. But there was one problem that he did not research. He needed 2000 hours flight time to be competitive in the airlines, and the F-4 pilots in Hawaii only got 10 hours a month. John marched over to the A-4M “super hawk” squadron and asked for asylum, and they were happy to have him. Two months later John, still a student, won the 45-degree dive bomb competition between all 3rd Marine pilots, which represented all west coast fighter pilots. His average hit was bull’s-eye on four of six targets, with a “Kentucky windage” non-computerized sight. Squadrons were calling John to “come on board” their units after training. He picked a unit that was about to deploy for a year in Japan tasked with defending the Korean peninsula. The skipper of the squadron made John his personal combat wingman, and they became close friends. One of John’s jobs as a new Marine captain was to report the readiness of the squadron back to the Pentagon. He took this job seriously because of the tense relations with North Korea. He reported that the unit was not combat ready due to lack of spare parts to fix radar and missile detecting equipment. As a result, John’s skipper gave him a career-ending fitness report for not signing off on the readiness issue. The two remained friends, as the skipper explained, “that’s not the way the system works.” John told his skipper that he did not care, as he was just building time for the airlines. The two became better friends after this conversation, and the skipper helped John get an advanced jet instructor job at his next assignment in order to get the 2000 hours needed to land a good airline job. John spent 25 years flying for major international airlines, starting at Eastern, and ending up as a captain for United. During those first turbulent years at Eastern, an Air Force Reserve fighter pilot who was familiar with his background asked him to join his squadron. With a true addiction to fighters and facing a possible layoff at Eastern, John joined the unit. John went to Desert Storm not quite convinced the U.S. was on the right side. Saudi Arabia and Kuwait were both brutal like Iraq, but Saddam Hussein did not rule over a theocracy. To John, the war was about oil, which he considered an immoral reason for war. So John asked the chaplain what he thought John should do. The chaplain asked John if he thought he was on “the right side of God.” John told him he did not know, and again asked the chaplain what he should do. The chaplain replied that he would not be part of the operation if he did believe he was on the right side of God. John, a “Pascal’s wager Christian,” was confused, as it still seemed immoral. But he also considered the morality of agreeing to use his F-16 to kill people, and then back out. He signed an agreement that he would use lethal force without bias if asked to do so by his country. That decision bothers him to this day. That’s how John decided to stand up for those who are unfairly oppressed. He began to question the tenets of the faith he had subscribed to for so long, but never fully believed. John is an advisory board member of The Military Religious Freedom Foundation, and was a 2011 Jefferson Award awardee. Since retirement John travels internationally, reads, and observes people all over the world. 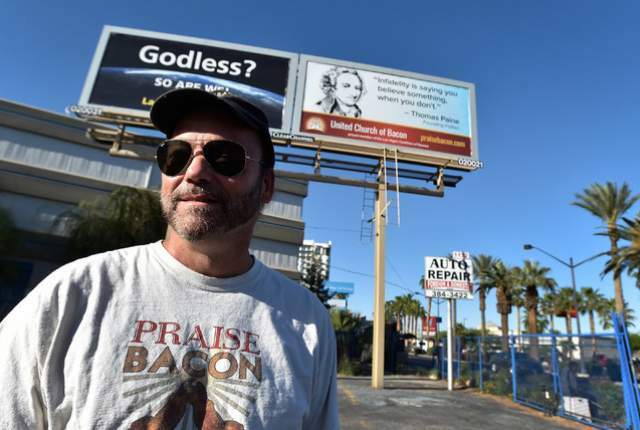 Prophet John first contact with the God of Bacon was on June 3rd, 2012 when a preacher asked his flock to “pray for John, he needs Jesus” and the Bacon God started speaking to Prophet John. Dancing is not a sin, and religious people sometimes take faith too seriously. So let’s celebrate skepticism & atheism in the name of the God of Bacon! Expect more divine revelations. Praise Bacon!